The countdown to my first ever market stall is well underway. I’m hoping people will love my stuff. I’m hoping people will buy my stuff. I’m hoping my car is a lot lighter on the way home than it is on the way there. Meanwhile I’m wrestling with my To Do (In Preparation) List. Instead of getting smaller it seems to be growing. Its now going to be HOT on Saturday* so an electric fan has been added to the things I’m taking with me. And a small eski with ice blocks to keep some water cold. *Only in Tasmania can you have snow on the mountain on Wednesday and a heat wave on Saturday. I don’t do well in the heat. But enough about that. 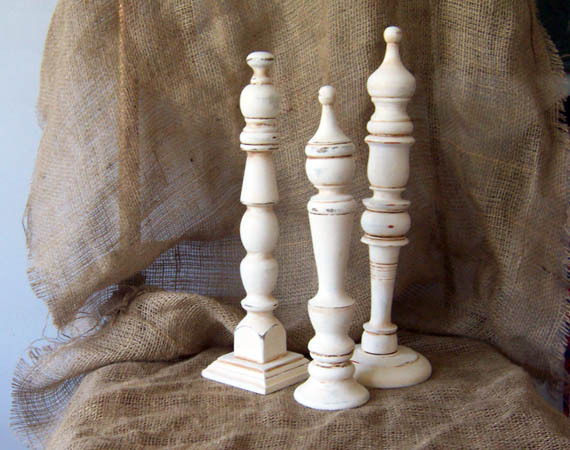 I’m sharing a few more items which will be coming with me to the market. 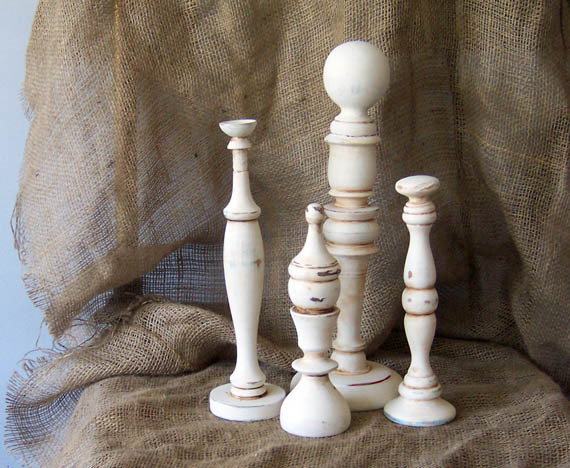 Here are some cute finials made from odds and ends I collected here and there. I did a bit of mixing and matching (odds & ends, here & there, mixing & matching…hehehe) and when I was happy with the results I glued them together. Once dry I gave them a couple of coats of paint, beat them around with some sand paper then glazed them with some burnt umber to age them. They’ve come up really nice I think.